Maps change. It happens today, but it happens so slowly, we don’t really think too much of it unless the change was accompanied by headline grabbing events, such as the civil war that resulted in the disintegration of Yugoslavia into Serbia, Croatia, Bosnia, Slovenia, Macedonia, Montenegro & Kosovo. Most changes are subtle, though: for example, if you were researching Sidney Kidd in Princeton, New Jersey, you wouldn’t be able to find his street address very easily on modern maps. Google maps points you to Jackson Avenue in nearby Rocky Hill, while Bing Maps would land you in the town of Nutley where Jackson street is a block over from Princeton Street. Why can’t you find Jackson Street in Princeton, a town founded in the 1700s? Well, Jackson Street was renamed to Paul Robeson Place in 1976 after the famous African-American civil rights activist & thespian who was born in Princeton. Of course, a change in street names doesn’t have much genealogical relevance, but changes in boundaries do, especially county boundaries. In this video, I’ll cover four topics around map changes. When county boundaries change, the records don’t move. Use web resources such as mapofus.org to understand geographic boundary changes. Remember that places can disappear as well. First, and most basic: Court records remain in the original county courthouse. For example, if your ancestor bought land in Gettysburg, Pennsylvania before 1799 and died there in 1801, you would find property records in York County registers, but probate records in Adams County. Why? In 1800, Adams County was carved out of York County but older records weren’t moved from the York County courthouse to the new one in Adams County. Remember that records were typically transcribed into large bound ledgers, so you couldn’t break the ledgers apart and easily separate records geographically. But even if the records were stored loose leaf, it would take a lot of effort to sort through the records for little reward. How do you track county changes? I find Wikipedia the most convenient source: most entries will tell you when the county was formed and how in the summary. If you want to visualize it, check out mapofus.org, which will show every county formation and boundary change for every state in the union. You can also do an image search on bing or google for county maps for a particular year. Of course, this isn’t much good if a place actually disappeared. Take a look at this old map of Oregon City, Oregon (above). Across the Willamette River is a town called Linn City. Look on a modern map, and Linn City doesn’t exist. There’s a West Linn, but no Linn. What happened? 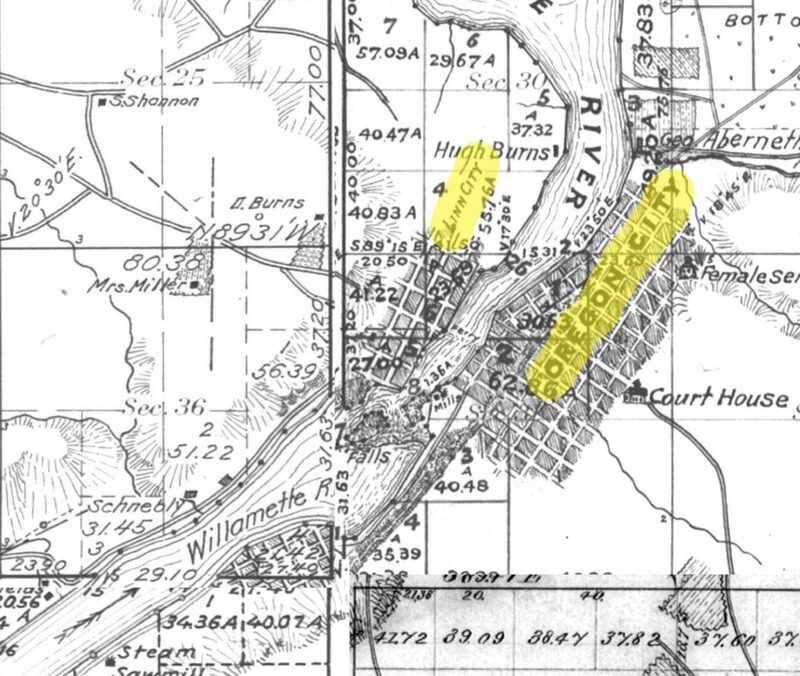 Well, in the fall of 1861, relentless heavy rainfall flooded the Willamette River and destroyed the town. Again, Wikipedia is a great resource to research a place that you can’t find on a modern map.